- And more--including tips to help you better understand kids! BONUS: You'll also discover how to help kids of multiple ages work together as a team...learn what to expect from different age groups...and be able to give young children the extra attention they crave while helping older children feel special as they help younger children learn. 1. God wants us to care for his world.^2. I am special to God.^3. God keeps his promises.^4. God will guide us.^5. God wants us to be peacemakers.^6. Sometimes God surprises us.^7. God wants us to be encouragers.^8. God wants us to be helpful and kind even when no one else is watching.^9. God forgives us as we forgive others.^10. Families are important to God.^11. God will help us through hard times.^12. We celebrate God's goodness.^13. Because God takes care of us, we can share with others. 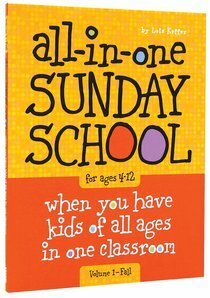 About "All-In-One Sunday School For Ages 4-12 #01"
Customer Reviews For "All-In-One Sunday School For Ages 4-12 #01"
This series is excellent. I have purchased all four books for the Sunday School at my church and we use it for grades 1 to 3. I like that is really does require minimum props and the activities for the children to complete are photocopies. You can also tailor the content to suit your group or the teachers strengths with a minimum of fuss. You can add your own ideas too. This series has literally saved me many hours each week in preparing for each term. The children enjoy it and the feedback from the teachers using it has always been positive.